The Customer Care Team of the Irish Regulator CRU, member of NEON, has published its annual report for the year 2017. While the total number of customer contacts decreased, the number of complex complaints remained stable. CRU does nevertheless predict an increase in both contacts and complaints in 2018. The Customer Care Team of CRU provides an independent, transparent, simple and free dispute resolution service to customers with an unresolved dispute with an energy supplier, network operator or Irish Water. In the field of energy, the Customer Care Team opened 232 energy-related investigations out of almost 3000 customer contacts. In most cases, the customer had to be referred back to the supplier or network operator for further information or to complete their complaint handling process. 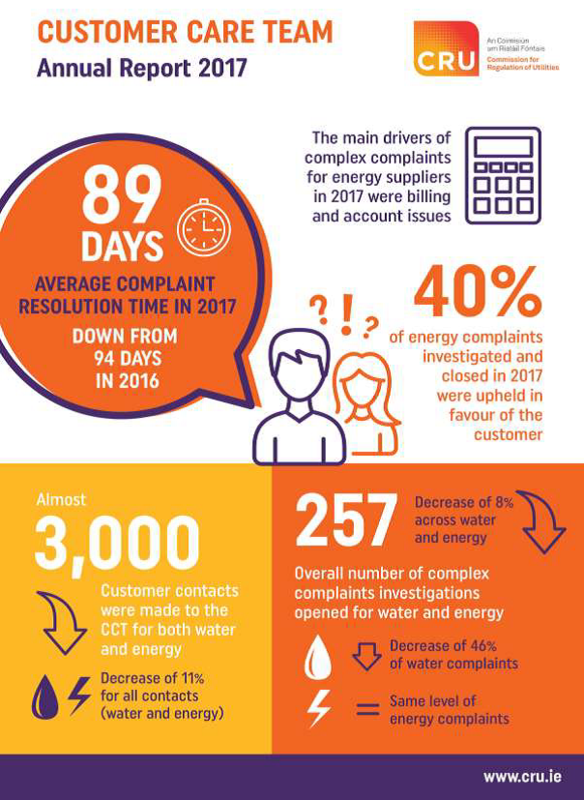 The majority of complex complaints closed against electricity suppliers in 2017 were concerned with billing (58%), which was also the key driver in 2016, while the majority of complaints against network operators concerned metering (44%). Wholesale prices for gas and electricity increased significantly towards the end of 2017, which has led to price increase announcements by suppliers. In addition, CRU launched a consumer awareness campaign, which may have an impact on level of complaints and contacts in 2018.